I encourage every artist, musician, entrepreneur, dreamer (whatever you like to call yourself) to create a vision board. A 'vision board' is created and inspired by YOU, with what YOU want to bring to life. Goals, dreams, aspirations. It is unique to every individual and serves as a daily reminder to not only stay inspired for our dreams, but to keep working toward them. The reward when we reach our dreams tastes oh-so-sweet. As an entrepreneur, I am constantly thinking of new ideas, places to travel and goals to reach to grow my business. I work from home, so my vision board sits next to my desk where I can glance over and be reminded of what I am striving toward. Check, check and CHECK. I received my drone certification and scuba license in the summer, and booked 2 vacations for this year that will take us to over 5 countries. When I revisit the vision board (at least once a week), I am reminded to not get downtrodden on the goals not yet reached, but to keep pushing toward them. How do you get started, you say? You may remember back in high school or college having to create collages for classes - cutting out magazines and pasting various items together. This is basically the same concept, except only you can decide what goes on the page - find magazines that inspire you already (i.e. Film+Music, Wired, Rolling Stone Magazine). Cut out words or phrases (or letters to form words) and images that best represent your goals and aspirations. Find things that make you feel happiness and excitement, joy and anticipation. Paste these items together on a wood board, foam core, cork board... whatever you fancy. When you are finished, place your vision board somewhere you can see it often. You see, the vision board has helped me create a positive, healthy mindset; Visualization is one of the most powerful mind exercises you can do. Or, as my mother-in-law likes to say, "it is about putting your intent out into the world." I am confident this will help you, too. 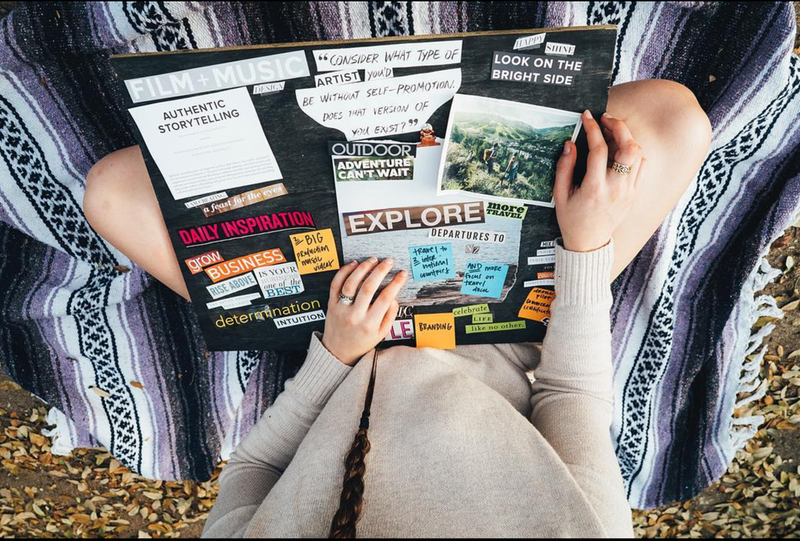 Click here to read up on why vision boards really work (scientifically speaking).